The Face Painter Set Up. When you need a complete set up to go or preparing for an event such as a party or fête then look no further than The Face Painter Set Up. The Face Painter Set up contains everything you need to have an active face painting station which can be used among multiple painters at a when out on a job. The kit contains everything your need to paint brilliant designs using a fantastic variety of splitcakes and 32g cakes. Start your face painting jobs today with one of these fantastic set ups. 1 x Diamond FX 30g Splitcake Case Complete with 21 Splitcakes (Colours subject to availability). (A fantastic range of splitcakes to create and array of quick and effective looks). 1x Diamond FX 32g Cake Case Complete with 12 Essential Colours. (12 essential colours perfect for outlining work or doing a full base coat). 1x Complete Brush Set with Brush Wallet. (A fine selection of brushes for both splitcakes and line work). 5x Diamond FX Half Moon Sponges. (Smooth and absorbent for doing full base cotes with 32g cakes or use vertically to use with splitcakes). 5x Diamond FX Half Moon Yellow Sponges. You can never have enough sponges. These yellow sponges are a little more course than their blue counterparts. (A brilliant selection of diamantes and gems to add sparkle to your work). 1x 60ml Water Spray Bottle. (To provide an even coat of water on your brushes and sponges). 20 x The Face Paint Shop's Official Cosmetic Glitter. To add sparkle and shimmer to your work. (To stick on your gems and create glitter tattoos). (Great for rinsing brushes while on the job and for cleaning post painting). 1 x Pack of Baby Wipes. (For cleaning brushes, paints or a child's face). 1x Awesome Face Painter Keyring. Diamond FX is one of the best possible face painting brands available in the world. European quality means the paints are ensured to have the strictest standards. Diamond FX have passed all ECC and FDA regulations. There is no perfume in any of the recipes. Even sensitive skin sufferers can use Diamond FX with no problems. Diamond FX paints glide on the skin, with the smallest amount of water. The paints are smooth, even and a joy to work with. They won't flake, crack or fade over time. On the skin, the paints feel soft and smooth. Paints won't stain the skin, and remove easily with warm water. Diamond FX is the most professional brand in the world, and the most popular brand over all. Time after time, professional painters recommend Diamond FX. Leave a note in your order and we will supply requested colours if available. 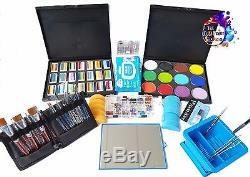 The item "The Face Painter Set Up Kit Diamond FX/TAG Professional Face Paints" is in sale since Sunday, February 4, 2018. This item is in the category "Crafts\Art Supplies\Painting Supplies\Other Painting Supplies". The seller is "thefacepaintshopcom" and is located in Wantirna South, Victoria. This item can be shipped worldwide.